Many of the things we have been taught about conflict are wrong, resulting in responses that can make a conflict worse instead of better. A basic understanding of how conflict works can provide insight into reliable techniques for constructive conflict resolution. These four simple conflict management secrets can shed light into the operational dynamics of conflict. Within any conflict, rest assured the people involved care about something. In my experience it is either an issue or a relationship. How many times do we end up in conflict because we are trying to control someone else’s thoughts, feelings or behavior? The #1 mistake made in conflict management models today is an emphasis on option generation and risk assessment. The misuse of these two tools will, in fact, prolong and escalate the severity of a conflict. Without need exploration it is possible to “end” a conflict but not actually resolve it, making matters worse. It is impossible to have a resolution that is not future oriented. What most people miss about conflict mechanics is that conflict itself is fueled by the future and not the past. This is the reason why the court process and the application of law are inadequate as a resolution process. Knowing how conflict works, it is possible to engineer a conflict management process that resolves conflict without simply ending it. Ignoring how conflict works will, more often than not, create deep dissatisfaction and, in the long run, increase the cost of conflict. For more detail on these conflict management secrets see my book, “Understanding Conflict: What are we fighting for?” White Feather Press, 2009. Hello, I don’t have a degree and I am certainly not an expert in this subject. However I do have a keen interest as I teach the police and security industry basic conflict management. I am always keen to expand my knowledge and try new techniques. I have been a front line police officer for a number of years, being female and small in stature I rely heavily on my communication and conflict management skills. Your first point of people only fighting about something they care about, in most instances that is true but in not all cases. I believe there are people who enjoy conflict, they enjoy the confrontation and the danger that brings. This is absolutely a barrier to communication and from a law enforcement perspective those people are impossible to deal with by traditional conflict management processes. How would you deal with those people? Your fourth point mentions the fact that the application of the law and court process is innadiquate as a resolution process. That is true, but surely the law and court process can act as a building block. Take a domestic violence incident, by removing an offender from a violent incident at that time can give both parties time to reflect, involve the relevant support agencies and start attempting to resolve their issues. The police/courts are in no way eqipt or trained to deal with this. Would you suggest we change the way we deal with these situations? Hi Anna, thank you for your questions. First question: Yes, there are people out there who simply enjoy conflict and fighting. Often they are the bully in the relationship, the school or the workplace. I could say that they are fighting about what they care about — i.e. their power or making others suffer. However, that could be a word-game and dodge your question. “How do you deal with these people?” is your question. You mentioned the barrier to communication this behavior creates and these people are impossible to deal with using traditional conflict management processes. I agree with you, especially if these traditional processes employ only communication skills. 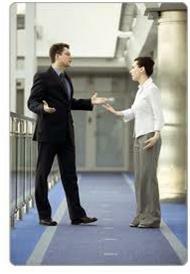 In my experience, communication skills do not resolve conflicts. People who enjoy the fight win either way. If you confront them, stand up to them, they get energy from the fight. If you back down and give in, they get satisfaction from the power boost. They have purposely designed their life (and the fight) this way. From a personal relationship perspective, the way to manage this type of person is to get out of the relationship as soon as you can. From a law enforcement perspective, the only language they listen to is greater power. The officer should assess quickly and act decisively to remove this person from the conflict (without getting into a power-struggle with them). The bully in the workplace is harder to deal with because they often have some authority over their victim. We can talk about that at another time. Second question: Would you suggest we change the way we deal with these situations [domestic violence incident]? First, I am not sure what you refer to when offering the law and court as a “building block.” Can you elaborate more on what that might look like? I am not against the court. It has an important place in our society. I regret it has become the first response (taking someone to court) in our culture, when it was designed to be the last resort for managing conflict. Just to clarify as I understand this: “Bullying and conflict” are different and therefore require different approaches, management and resolution. Any “conflictual situation” arising out of a bullying scenario needs to be examined to understand the exact dynamics and deliberate masking of what really is at hand, if there is to be any management of the situation and anything other than a coerced and unfair resolution. Conflict arising out of non bullying situations can be mostly managed using the methods as desribed in the 4 conflict management secrets listed above. Yes. I never recommend my conflict management techniques be used in the face of abuse or bullying. No one should suffer verbal, physical, or emotional abuse. My conflict response training is not meant to be used for managing bulling. My recommendation in these settings is: 1) to leave if and when you can, i.e. remove yourself from the relationship or, 2) if you can’t leave, report it to someone in authority with the power to stop it and provide a safety plan. Thanks for offering clarity. Your comment was quite helpful.